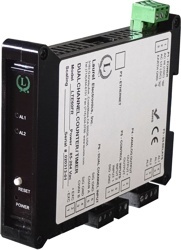 The LTSE Ethernet input, analog output transmitter accepts Ethernet serial data using the Modbus protocol, Laurel ASCII protocol, or direct ASCII characters, and converts this data to an isolated, scalable 4-20 mA, 0-20 mA or 0-10V analog output. The unit is housed in transmitter case which is only 22.5 mm (0.89") thick and fits on a 35 mm DIN rail. It is normally powered by AC (85-264 Vac), but can optionally be powered by low voltage AC or DC. Ethernet serial data input, isolated. The Modbus protocol, Laurel ASCII protocol, or ASCII characters are supported at data rates to 19200 bps. Modbus implementation is fully compliant with Modbus over Serial Line Specification V1.0 (2002) in RTU or ASCII operation, with up to 247 digital addresses. Using the Laurel ASCII protocol, the serial-to-analog converter is able to retrieve digital data from long character strings. Users can specify character positions, start and stop ASCII characters, how many characters to skip, and how many characters to process. Slave operation requires connection to a master. Analog transmitter output, 16-bit, scalable and isolated. User selectable 4-20 mA, 0-20 mA or 0-10V levels. 16-bit resolution provides an ultra-fine resolution of 0.0015% and accuracy better than 0.02% of output span. Output isolation from signal, power and serial communication grounds is provided by a separate on-board transmitter power supply, thereby eliminating potential problems caused by ground loops. The supply can drive 20 mA into a 500 ohm (or lower) load for 10V compliance, or 10V into 5K ohm (or higher) load for 2 mA compliance. Ability to extract readings from long ASCII data strings. You can specify character positions, start and stop ASCII characters, how many characters to skip, and how many characters to process. Slave operation requires connection to a master. Not applicable to the Modbus protocol. Dual solid state relays for control or alarm, isolated. Rated 120 mA at 140 Vac or 180 Vdc. Universal AC power, 85-264 Vac, or low voltage power, 10-48 Vdc or 12-32 Vac.